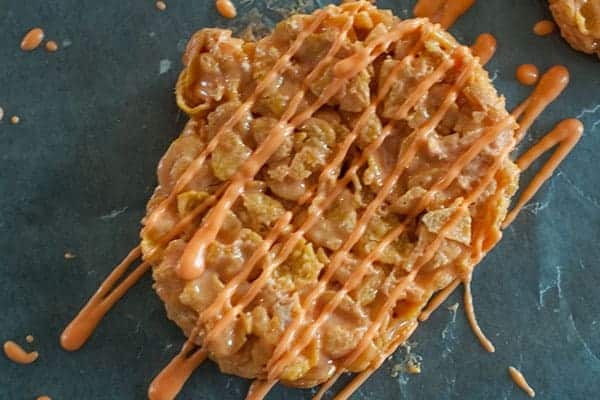 Pumpkin cornflake treats. An adaptation of the classic corn flake wreath. Similar to rice crispy treats, but even more delicious. Hello and welcome! 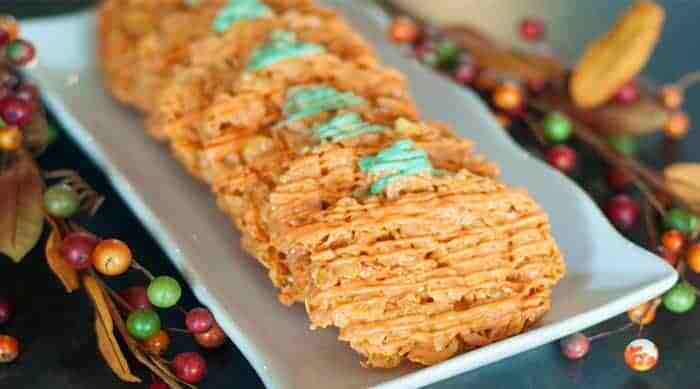 This week I’m sharing a family recipe for pumpkin cornflake treats. To say this is a family favorite is an understatement. In fact, it’s normally the first thing to go on our holiday sweet table. It’s an adaptation of the classic corn flake wreath made at Christmastime, but we’ve extended it to most other holidays. (Because they’re THAT good.) 🙂 Even the Fourth of July with my Red, White, and Blue Corn Flake Cake. 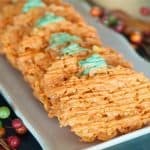 The recipe is similar to rice crispy treats, but somehow corn flakes make a world of difference in flavor. 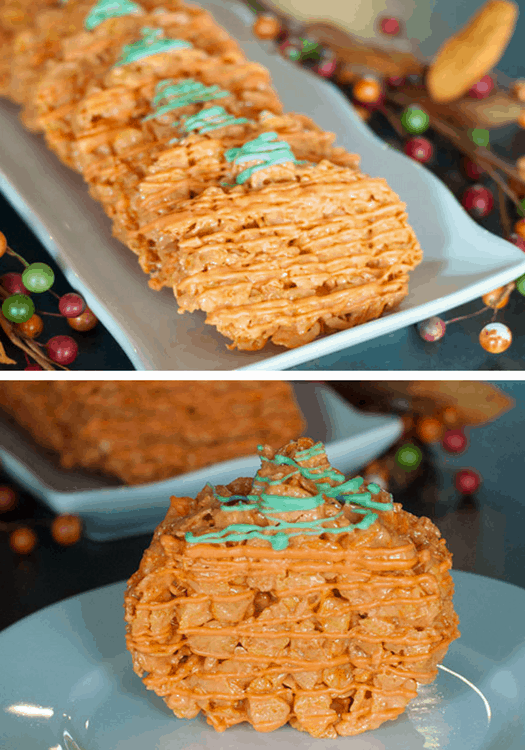 Bring them to a holiday party for school or make them for your family gathering during the holidays. My Mom will usually add them to holiday care-packages. Yes, my sisters and I are all in our 30s and we still receive care-packages from my Mom. The tradition started while we were in college and now includes our husbands and kids. So much fun. I have to warn you — these treats are super sticky and messy to make. But it’s so worth it. 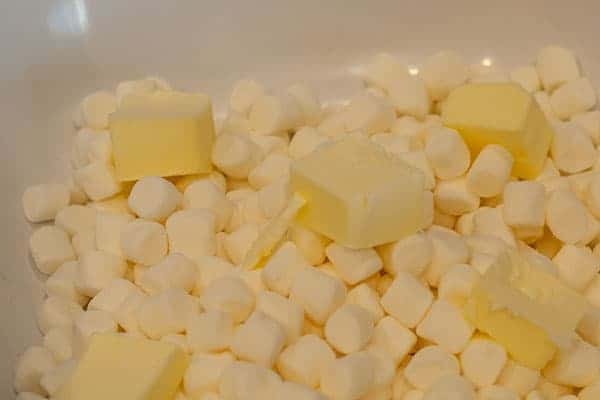 🙂 In a large bowl, add 6 cups of marshmallows and 1/2 cup butter. Slicing the butter allows it to melt a little easier. Melt the butter and marshmallows in the microwave in small increments, stirring frequently until smooth and all the butter is melted. 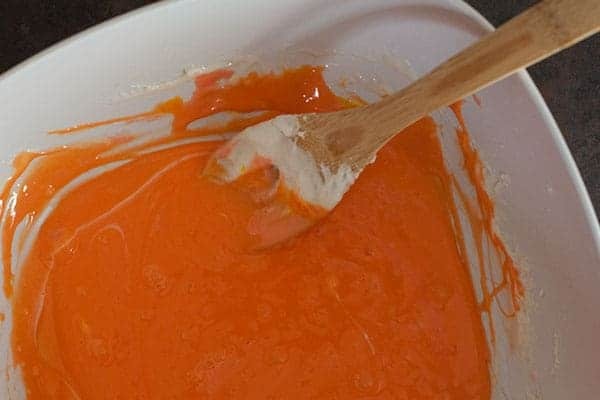 Add orange (or red and yellow) food coloring to the melted marshmallows and butter and mix well. See what I mean by sticky and messy! Fold 7 cups of corn flakes into the marshmallow mixture. 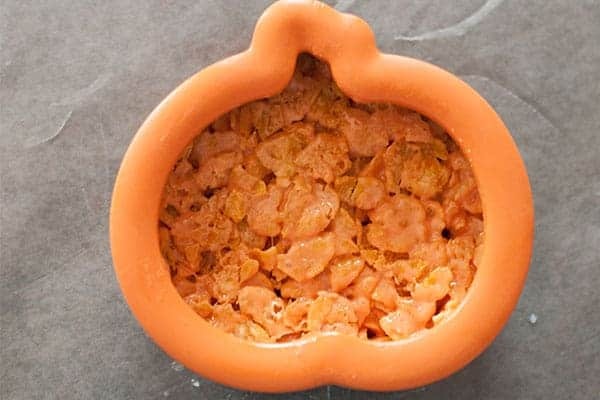 On top of wax paper and with greased hands or a spoon, press the cornflake mixture firmly into a pumpkin shaped cookie cutter. You can use butter, spray or shortening to grease your hands. I like the spoon option better, but you still have to grease the spoon when it gets too sticky. And greasing the cookie cutter will help as well. Carefully lift the cookie cutter and repeat. The recipe should make about 10 to 12 pumpkins. Depending on the size of your cookie cutter. But you don’t want the cookie cutter to be too small or the shape to have too many nooks and crannies. Cornflakes can be a little harder to work with than rice crispies. Adding drizzled chocolate makes them look just a little more festive. But it’s completely optional. 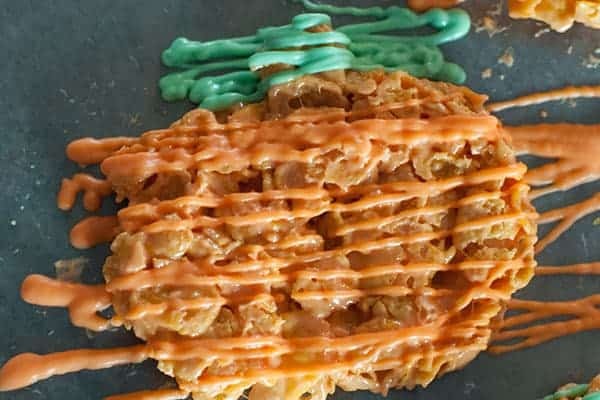 Melt the orange candy coating and drizzle over the pumpkins. I find Wilton’s Candy melts to be the easiest to use. Plus I normally have some on hand from making cake pops often. I add a candy thinner to make it really easy to drizzle. Melt the green candy coating (adding candy thinner if needed) and drizzle over the “stem” of the pumpkin. Allow the candy coating to dry. Then remove from the wax paper and store in an airtight container until you are ready to serve them. I hope you enjoy! Easily one of the favorites on our holiday treat table. Please stop and say hi in the comments. Have you made something similar? Thanks for stopping! An adaptation of the classic corn flake wreath. Perfect for Halloween or Thanksgiving. In a large bowl, add 6 cups of marshmallows and 1/2 cup butter, sliced. Melt in the microwave in small increments, stirring frequently until smooth and all the butter is melted. Add orange (or red and yellow) food coloring and mix well. 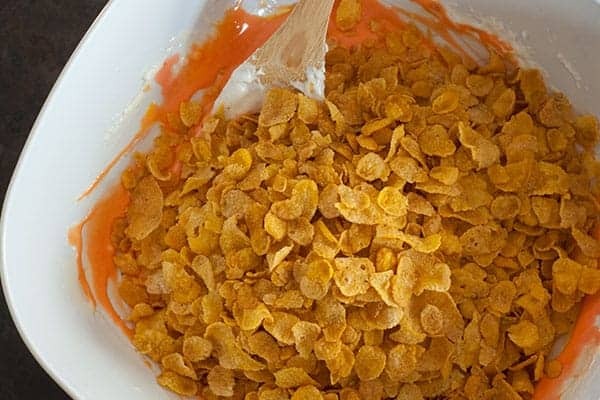 Fold cornflakes into the marshmallow mixture. 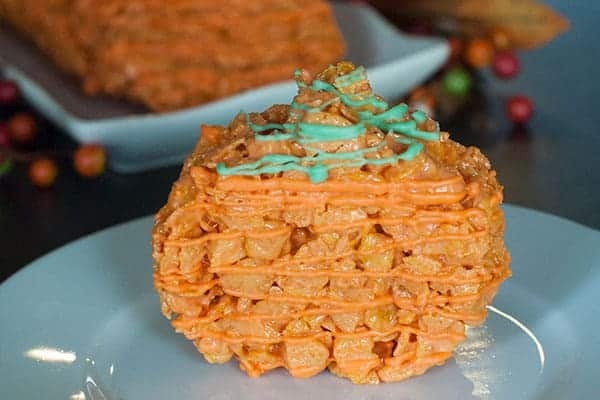 On top of wax paper and with greased hands or a spoon, press the cornflake mixture firmly into a pumpkin shaped cookie cutter. Carefully lift the cookie cutter and repeat. Melt candy coating and drizzle over the pumpkins. Melt green candy coating and drizzle over the “stem” of the pumpkin. Allow the candy coating to dry. Store in an airtight container until you are ready to serve. Enjoy!